If you do business with Walmart US, you likely inhaled sharply when you read the phrase “OTIF”. It is no secret that the OTIF program, launched in the US in August 2017, has presented suppliers to Walmart US with significant challenges. For the uninitiated, OTIF stands for “On-Time / In-Full” with respect to product order delivery. The initiative combines the two previously independent performance metrics “in full” and “on time” into one metric, OTIF. Well, it’s Walmart Canada suppliers who are next. The official program was just launched a few weeks ago, after a long pilot program in 2018. There are significant differences between the OTIF requirements and reporting applications between the two countries, however. While suppliers doing business with Walmart US are able to automatically assess “accountability” for non-compliant POs via the OTIF Scorecard, the Canadian version of OTIF requires suppliers to manually assign accountability via the OTIF application on a weekly basis. 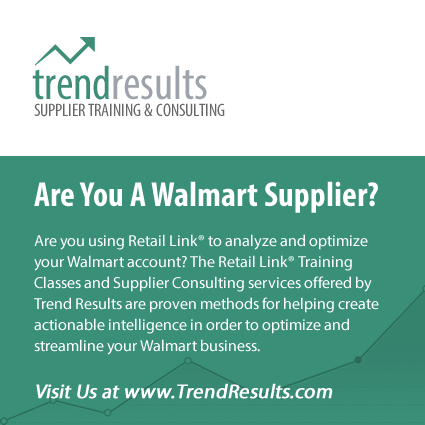 To learn more about the OTIF initiative for Walmart Canada, you can register for a 2-hour webinar with Trend Results, a supplier education and consulting firm, based in Dallas, Texas.